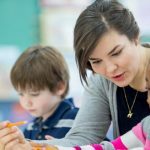 Checking for Student Understanding: How and How Often? Home » Checking For Student Understanding: How and How Often? The answer is you can never check for student understanding too much. Check for understanding at least three times a lesson. Minimum. Teachers should check for understanding at least three times per lesson – after Introduction to New Material (INM), Guided Practice (GP), and at the conclusion of a lesson. Far too often teachers motor through INM right into GP without checking the class’s level of understanding. Yellow: Maybe, but not sure. A quick glance at the colors will indicating how students are doing on the learning target. The information helps to know when to move on, re-teach, or pay close attention to the groups of students who are not quite catching on. The main purpose of this strategy is to provide a pulse check about how students are doing as instruction takes place. An added bonus – students realize when they are raising more red cards than desired. Open the door for those students to seek additional help. Give all your students a chance to experience success by practicing something that will result in a lot of green cards. This helps your students celebrate their wins and build their confidence.